I’ve seen peel-off base coats in the past, but never pulled the trigger on buying one. I’ve been watching more videos by Cristine of Simply Nailogical and she loves her peel-off base coat so she can switch up her manicure super often without killing her nails. After seeing her use it under gel polish and her Best Peel-Off Base Coat video, I decided to pull the trigger and order her favorite – ÜNT Ready for Takeoff Peelable Base Coat – and do my own experiments. I started simple with using Ready for Takeoff under a regular polish. I purposely went through my collection for a cheaper, older polish. This Claire’s Cosmetics Magic has easily been in my collection for 15 years. As a nail polish hoarder, I don’t ted to throw polish away unless it’s just beyond the pale in performance or the cap dries hopelessly shut or breaks or something catastrophic. So I wanted to test it under a less-than-ideal polish. It worked like a charm! It lasted a couple of days and peeled off well when I was tired of the color. My nails were not dried out at all and the only clean up I needed to do was a little bit around the cuticles where it was clear I hadn’t gotten the base coat in well enough. 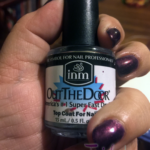 As an aside, I also tried a new quick dry top coat, INM Out The Door Fast Drying Top Coat, because my trusted Glisten & Glow Top Coat (formerly called HK Girl – Fast Drying + Super Shiny Top Coat) is getting too old and gloppy to really work well. The INM didn’t seem to dry nearly as quickly as Glisten & Glow, but the consistency was definitely nicer being brand new and the shine was great. I’m disappointed that I have a half a bottle of Glisten & Glow PLUS a half of their larger refill bottle left and it seems to have expired past being able to use it too well, but I had the same disappointment with Seche Vite Dry Fast Top Coat before I tried Glisten & Glow. Seche Vite would somehow shrink the polish back from the tips, but neither Glisten & Glow or INM seemed to do that, so I guess I’m still not giving up on Glisten & Glow but, in a pinch if I run out, I can easily go to Sally Beauty to buy INM Out The Door whereas I can only get Glisten & Glow Top Coat from their website. So, we had a mini experiment within my larger experiment! 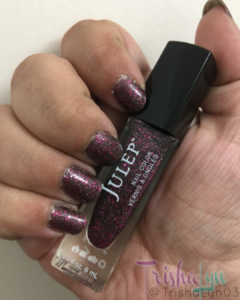 I got this awesome Julep Rosie in my August Maven box, described as a charcoal grey with magenta glitter. One of the main benefits of using a peel-off base coat is for use under glitter polishes. 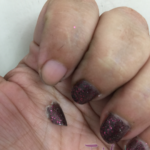 If you’ve ever used one, you know that they can be a royal pain to get off without a million gallons of acetone, scraping, and even then I know I’ve thrown in the towel and just put a different polish over pieces of glitter. I had learned from using the Ready for Takeoff under the regular polish that I needed to make sure to coat the entire nail, so I used it more liberally with the glitter polish. Maybe TOO liberally. Within 2 hours of finishing my manicure, my left index finger nail popped right off! (That sounds weird to say it, but you know what I mean, the polish, not the actual nail!). After examining the peeled off polish, I could see that I’d flooded the cuticle, so that’s why it popped off so quickly. The rest lasted a few more days before I made the “mistake” of doing the dishes wearing rubber gloves and some of the nails popped off inside my dish gloves! So I know now that I cannot keep a peel-off base coat manicure on through chores. Now, for some real stakes! If the Ready for Takeoff didn’t truly protect my nails from the gel top coat, I’d have to use a lot of acetone and maybe even grinding. I wanted to do another experiment-within-experiment, so I tried another technique I’d seen Cristine make by using a no-wipe gel top coat over regular creme polish. I got the one she recommended, OneDor One Step Gel Polish No Wipe Top Coat. 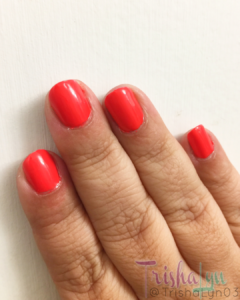 I had recently gotten a pedicure with my favorite pedicure color – neon orange – so I decided to try out the Julep April I got in a recently Maven Box (June’s, I think). It’s not neon (they describe it as a Vermillion Crème) but I thought it would match well enough but not be too crazy. 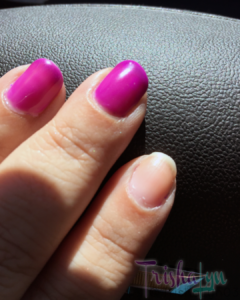 I was worried that the gel might not react well with the creme and I did have some bubbling issues – one nail seemed to get a little ripped when I was on a photo shoot and had t be peeled off. I left the rest on for as long as they’d last and they made it through the rest of the week before I was ready to peel them off to try gel polish AND gel top coat. As you can see, my left index finger is just a nudist at heart. Almost every time I used the Ready for Takeoff, that pesky nail would pop off. I found that it happened WAY more with the gel polish + gel top coat. I used Finger Paints Main Art-Traction Gel Polish, a very jelly looking purple, and wore this manicure for 3 days, having to re-do the left index finger EVERY. SINGLE. DAY! I did the initial manicure about mid-day on a Wednesday, and when I got home from some appointments, the finger had popped off. So I tried a different polish combination on that finger – white Finger Paints Stay True to the Art Gel Polish with Sally Hansen Salon Gel Polish Purple Prisms on top. I didn’t even get a picture because it popped off just after dinner out at a restaurant. I redid it that night with Main Art-Traction again and by Thursday afternoon it popped off again. So I re-did it again and lo and behold, Friday afternoon it popped off again. I don’t know why! Every other nail stayed on like a champ but that one just didn’t. Every time I re-did it, I made sure not to flood the cuticles with the peel-off base coat, made sure to clean up any stray gel polish before curing it, and none of it made a difference. Oh well. When all was said & done, I feel like ÜNT Ready for Takeoff Peelable Base Coat is a fantastic peel-off base coat that leaves your nails in great condition. The first few times I applied it, I will warn you that it felt a little tightening and weirdly cool on my nails but I got used to it pretty quick. I generally like my manicures to last, so I know that I won’t be using this peel-off base coat for every manicure. I’ve been wanting to do more swatches of my polishes I get from the Julep Maven Box, so this will help. I hope that, with some time, my left index finger decides to embrace the polish and stops popping off, so I’m giving her a break from the peel-off life for awhile. If you want to get yourself a bottle, it retails for $12.98 with free shipping on Amazon. It says it can be used as a non-glue based, non-latex based barrier on the skin too so… maybe that’s what I’ll try next! Great review. I’m so out of touch, I had no idea this product even existed. It sounds like a great idea and something I will check out. No more doing dishes! Me too, i have to do the dishes and lajndry, so my nailpolish are always ruined. But its okay because I got a chance to change the colors! A peel off polish sounds like what I need. I just love the shades that you choose. Thank you! Just to be clear, the polish itself isn’t peelable, it’s the base coat under the polish. I remember when I was a kid the Bonne Bell peel off polish for little girls… this is definitely taking that to the next level! I don’t always do my nails for that reason! Dishes! Now I have to check these products! Having a peel off base is genius, would certainly save your nails when you want to change up,your polish. Plus, no more struggling to get stubborn polish off! Peel off is great. I know there are days when I want some fun or funky, but I know I will not want it tomorrow. My nails are so dry and brittle right now and I need to find a cute gel color. I really like these colors although I don’t normally go so bold. There are plenty of blush pinks and nudes in gel colors nowadays too. 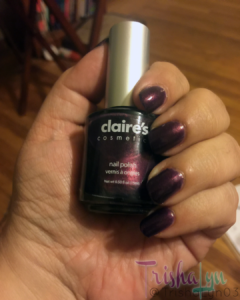 The Finger Paints brand is all pretty bold and was a little… jelly for me but if you tried a different brand you’d probably be able to find a more opaque, creme finish gel polish. I didn’t hear about this product before, but this is probably because I get my nails done at the manicurist and I have no idea what are they using. I am hopeless in getting my nails done so I have to had someone else doing it for me. Hmm I have a bit of a peeling compulsion, so I don’t know how long this would last on my nails. But I hate how dried out they get. I might try it! I think this would be utterly satisfying for you! My nails looked just as nice as when I painted them after peeling the polish off! I have no experience with this but I’ll bet my GF does, she has an extended polish collection and changes as often as she changes outfits. This would be PERFECT for her then! I have never heard of this! Of course, I’m a guy, but there are women in my family that paint their nails and they’ve never mentioned this! I’ve got to tell them about this! I hate doing my nails. I like that the peel off is easy to use and leaves your nails in good condition. I will give it a try. Hmmm – I think I would give this a try. I always hat the removal process for my nail polish – especially gels. The remover is so harsh and always leave my skin so dry. This seems like a really great solution! I have never heard of a peel off base coat. This sounds like something I definitely need to try.